In a comprehensive study published in the journal mAbs, we found that 31.9% of hybridomas producing ‘monoclonal’ antibodies actually secrete multiple antibody species – meaning your antibody may not be as ‘monoclonal’ as you think. 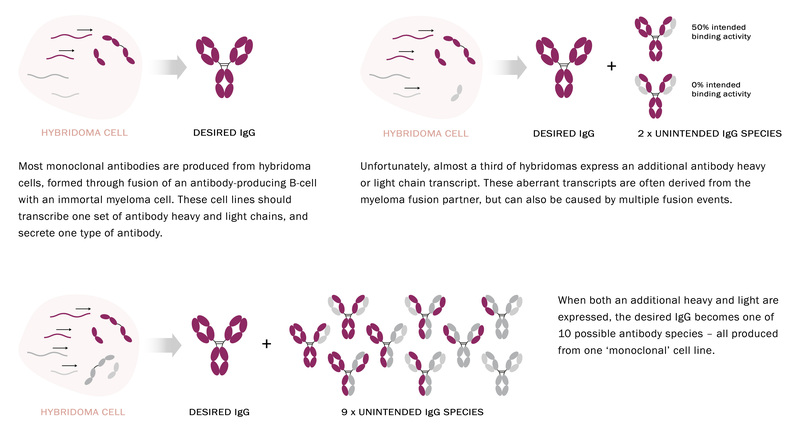 A typical antibody IgG is made up of two heavy chains and two light chains arranged in a ‘Y’ shape. Two antigen binding domains on the arms of the ‘Y’ recognise and bind to a particular protein target. The specificity of this interaction is used extensively in assays across the life sciences. When additional antibody chains are present, new combinations of heavy and light chains form. The resulting cocktail of antibody species has reduced binding to the intended target, and may show binding to unintended targets. To make matters worse, the relative abundance of each antibody species can vary between batches, making it difficult to obtain reproducible results. The study confirms what Absolute Antibody has known for years – that an unacceptable number of ‘monoclonal’ antibodies used across research and diagnostics are unreliable. In contrast, recombinant antibodies are absolutely defined by their amino acid sequence. This means that when you choose a recombinant antibody for your next assay, you can be confident about what’s in that vial. What should I do with my hybridoma? Sequencing your hybridoma is the best way to ensure that it is truly monoclonal whilst also securing your antibody for the long term. You can read more about hybridoma sequencing here. Are there other benefits to choosing recombinant antibodies? Recombinant antibodies also benefit from minimal variation between batches, higher purity, and expanded possibilities through antibody engineering. You can read more about our antibody engineering capabilities here. Contact us with any questions, we love to hear from you!